Panthers star Robert Lambert misses the meeting with Ipswich after scoring eight points for GB in a World Cup qualifier. Peterborough Panthers promoter Ged Rathbone has called for a special performance to mark a special occasion tonight (June 12). His unbeaten city racers entertain East Anglian rivals Ipswich in a Premier League clash at the East of England Showground (7.30pm) – 45 years to the day of their first-ever home meeting. It was on June 12, 1970 that Panthers took to their own shale for the first time when thumping the Rayleigh Rockets 51-27 in British League Division Two in front of a crowd reported as being in excess of 2,000 fans. It is safe to assume the current bunch of riders would settle for a similarly emphatic outcome tonight as that managed by the side of Pete Seaton, Richard Greer, Andy Ross, Brian Davies, Pete Saunders, John Stayte and Mervyn Hill on opening night all those years ago. Rathbone, who masterminded the club’s successful survival bid last winter, said: “This is a club with a long and proud history as a 45th anniversary highlights. “The original Peterborough team started off with a home win all those years ago and we need to mark the occasion by picking up a good result of our own. “I would happily the same sort of victory the 1970 team managed and I would certainly love to see a crowd of that size turn out as well! “Our own attendances have been pleasing so far and we have certainly been giving the supporters some great entertainment. “The racing has been outstanding for most of the season and that is why we could not just sit back and watch such a great track and top facilities potentially be lost for good. “We have said all along though that this was not just about surviving. We need to secure the long-term future of the club and we also need to be successful. They have flared up again ahead of tonight’s clash with Lewis Blackbird losing his race to be fit after a heavy crash on May Bank Holiday Monday. He is still being troubled by back pain after a spill in which he also suffered a couple of broken figures. Panthers have drafted in Redcar racer Matej Kus as a guest and the absence of teenage star Robert Lambert is likely to prove a bigger blow. Club chiefs were expecting the 17 year-old to be available after Great Britain bowed out of the World Cup at the Race-Off stage last night (Thursday). 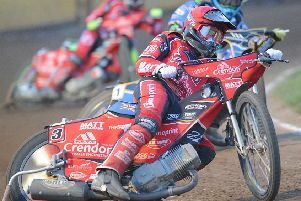 But Lambert has told them he does not have sufficient time to travel back from Vojens in Denmark where he scored a highly creditable eight points as the Brits were pipped to victory by Poland. However, it is understood that two Ipswich riders involved in the same meeting – Danny King of Great Britain and American ace Gino Manzares – will make it back to line up for the Witches. Ipswich were tipped up as likely title-winners ahead of the campaign, but they have made an indifferent start to the league season. They lost at home to Newcastle last night when without King and Manzares. Panthers: Brady Kurtz (guest), Rider replacement for Robert Lambert, Matej Kus (guest), Michael Palm Toft, Ulrich Ostergaard, Oliver Greenwood, Simon Lambert. Ipswich: Danny King, Gino Manzares, Nico Covatti, Rider replacement for Cameron Heeps, Rohan Tungate, Stefan Nielsen, Ritchie Hawkins.